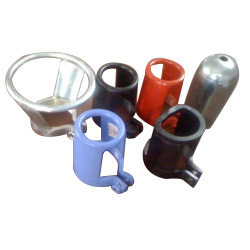 A cylinder essentially has three parts – the filling container which is termed as cylinder, its valve and safety guard. Cylinder valves are fitted externally and are not the integral part of the cylinder. The handling of cylinders has been a major issue with our clients in India and worldwide. It is seen that during the period of transit, cylinders are roughly handled because of which they are sold and shipped separately with its valve guards. The cylinders are manufactured under stringent quality norms that are at par with international standards and hence they are tested to bear any abrasion. Therefore, the safety of valve is equally important as the breakage of valve may lead to either loss of the product or may even lead to accident of the personnel handling the cylinder. It is important to highlight the benefits of using safety guards. It is a compulsory requirement but in practice is not much monitored by the plant users.